A careless insult delivered by a senior architect regarding the design quality of modern Scottish architecture, only served as a catalyst for brothers Alasdair and Neil Stephen. The brothers founded their architectural firm in 1996 on the premise that their designs would enhance the quality of life for its occupants, and also vowed to honour their Scottish heritage in their designs. Mission accomplished. Their award-winning architectural firm is based in Glasgow and on the Isle of Skye. But their designs have become popular in regions far beyond the Highlands with clients across the UK and Europe. 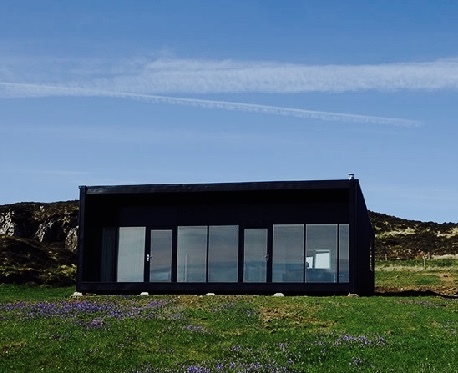 In addition to designing landmark community buildings and private homes, they offer self-build kit houses, through Hebridean Homes. There are several different models, but one of their designs will be of particular interest for those wishing to downsize. The “Airigh” is a home which can vary in size from 30 square meters to 70 square meters. For those not up on their Scottish Gaelic, ‘Airigh’ means hut, or a collection of huts, that were often used by shepherds in remote areas. This particular form of hut however, is anything but ancient. The airigh is a contemporary, unfettered design, which was inspired by rural architecture. The homes are also somewhat customizable to each homeowner and green options can be incorporated into the design with solar and wind power. Although the homes are used by many as garden cottages and holiday homes, Alasdair says that there is one couple that is using the Airigh as their full-time home. Your ability to live in one year-round would be entirely dependent upon your local planning permission board and its particular ordinances for your area. Though the home can be built as small as 30 square meters, as a seasoned architect, Alasdair recommends a minimum of 70 square meters for a full-time dwelling. “People deserve to have a decent size home to live in,” he adds.